My sweet father was diagnosed with a 6 cm glioblastoma brain tumor on November 7. They gave him 2 months to live with no intervention and 6-9 if he had radiation. Sadly, he was just too sick to go through the treatment. At 89 and after an emergency intestinal surgery, his body pretty much wore out. It is said “old soldiers never die, they just fade away” and this is exactly what happened. Daddy just faded away until he left us on December 3, 2014. With the passing of time, a strong faith in the purpose of this life and a belief in the hereafter, we are slowly healing. And, I must admit that comfort food has really helped! A Costco roasted chicken, ‘gravy like’ soup and mashed potatoes did the trick. I’ve actually made this recipe 4 times in the past couple of months…it tastes good, fills the tummy and provides comfort to the soul! I bet you didn’t know a recipe could do all that did you? I hope you enjoy a little comfort in your life!! Place the whole chicken in a large pot. Cover with 10 cups of water. Cook this down on low heat for 4-6 hours or until the broth has reduced to 6 cups and is a nice tan color. Or just open 3 cans of chicken broth! However, the homemade tastes better and is good for you! Take the chicken out of the pot, pour the broth through a sieve into a bowl and then back into the pot. Remove all chicken from the bones and chop into bite-sized pieces. This will yield about 5 cups of chicken. Set aside. Melt butter in a frying pan. Add flour and chicken base. Stir until combined and continue stirring until thickened. Add milk in small parts, stirring and cooking until mixture is smooth and creamy. Make sure to get all the lumps out. Next, add this to the pot and stir to combine. Now let it cook a little bit longer until the soup is thicker. Prepare potatoes according to directions on the back of the box, reducing butter to only 1 tablespoon. Place an ice-cream scoop of potatoes in a bowl. Ladle hot soup over the top and enjoy! 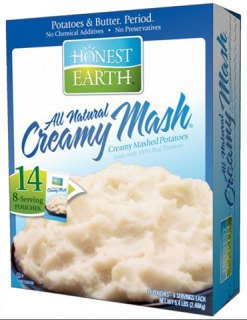 The “Creamy Mash” potatoes are in a blue box at Costco. The package includes 14 servings for about $10 and is made of one ingredient: potatoes. Yes, that’s it. A perfect alternative to homemade when you are busy and hungry! You may also make this soup gluten-free by using corn starch or gluten free flour for thickening. This looks dreamy! Can’t wait to try it .